We did many DIY projects for our wedding but one of the ones I was most determined to do was our ceremony pew cones and flowers. In hindsight, making the cones wasn’t tricky at all (I modified this tutorial) but mucking around in my garden at midnight the night of my wedding was a huge mistake. I wanted them fresh! — but seriously. This allowed me to measure the ribbon lengths needed to loop around the pew tops and confirm the best cone stock color (white looked best against the darker wood) and size (a little wider and longer). Seeing the sample arrangement IN the cone helped me hone in on the color scheme I wanted (I added pops of pink to the white and green), how much material I’d need, and also helped me decide what would last the longest once it was picked from the garden. Snapping a picture was a great visual guide for re-creating them on the wedding day. 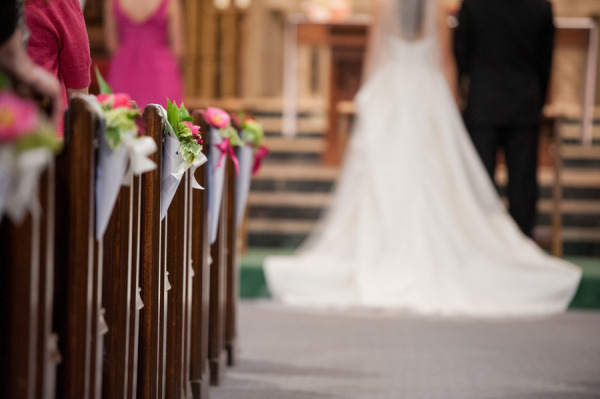 If you’re marrying in a larger church, try going every other pew and stopping 10 or 12 rows into where guests are seated, but be sure to add cones to the pews at the top of the aisle where ushers will stand to greet and seat guests. This is just a fact. But jamming more than 1-2 stems in a florist vial is VERY difficult. Especially if you’re using a woody-stemmed flower like a hydrangea. We used a mix of florist vials and plastic baggies with water-soaked paper towels taped with electrical tape. These were then jammed into the pew cones and stuffed with tissue paper, paper towel or anything we could find to make them sit up straight. Do your homework! Know what is in season on your wedding date and test-drive some grocery store bouquets to get a feel for what lasts in and out of water and what doesn’t. Ferns and hydrandgea are water-suckers, so wilting is very likely with these. Carnations last for-ever in (and out of) water and I think they are stunning in large, single color bunches. Lilacs are lovely and smell gorgeous too, but again, they need lots of water. Be tactical and practical. Guests at the ceremony will probably NOT remember pew cone flowers the way that you will, so focus on the overall impact and less on the flowers themselves. At best, they will make for a gorgeous photo-op, but ceremony flowers will not be missed if you opt to skip them. A really great faux hydrangea in a cream or ivory, mixed in with some heartier live flowers and greens can make a beautiful statement. I hesitate to ever recommend fake flowers, but to save a few bucks, my general advice is that the closer the flowers are and the longer the period of time guests will see them, the more sense it makes to spend on them. So it makes sense to skimp of church flowers but spend on reception table flowers I think. Avoid “diamond white” faux or silk flowers though—they can look cheap. I used a really thick, 10×10, white scrapbook paper card stock and glue gun to create our pew cones, then poked two holes in the sides of each and strung 1/4″ satin ribbon through to the front, tied a little bow in the front and called it a day. But there are SO MANY alternate options I wish I’d considered that would have made it easier to keep our flowers in water. If you’re doing your ceremony flowers yourself, look into plastic container options and spare yourself the water/baggie/flower vial headache, I beg of you! Think about it. Once you get all those mini-arrangements made, you need to get them to your ceremony site and rig them all up. Think through the logistics, but plan to delegate this. 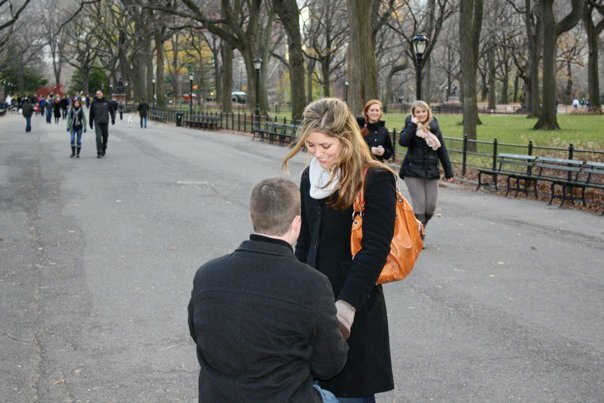 If you can have friends, family, or bridesmaids help with this the night before, even better. Look what we had waiting for us when we returned from our honeymoon. Dozens of postcards from friends and family detailing their favorite memories from our wedding, advice for the future, and wishes for our new life. Possibly one of the best, easiest, most meaningful, and inexpensive little DIY projects we did for our wedding. THANK YOU ALL so much for taking the time to fill these out and return them to us. They made our return from paradise a little brighter. 1. 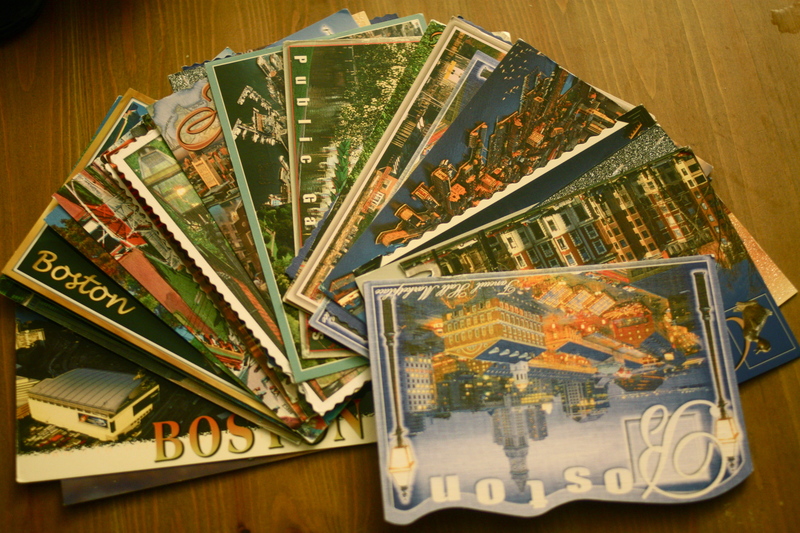 First, we purchased an assortment of Boston postcards. If we’d thought of it sooner, we could have sought out cards from the various places we’ve traveled to together like Florence or NYC, or even Hawaii, to make it more personal. 2. Then we stamped and addressed them to ourselves. Don’t forget to write “the Newlyweds” or Mr. and Mrs. (whatever names will be). We thought our Aloha stamps were perfect. – We purposely opted to do these via our hotel gift bags and not at the wedding so friends and family wouldn’t feel rushed to fill them out or share a favorite memory from the evening before it had even ended. But with some forethought, I bet it could be done at a wedding as well.